These Sesame Sweet Potato Falafels are made with chickpeas, sweet potato and toasted sesame oil. They’re perfect for a packed lunch! 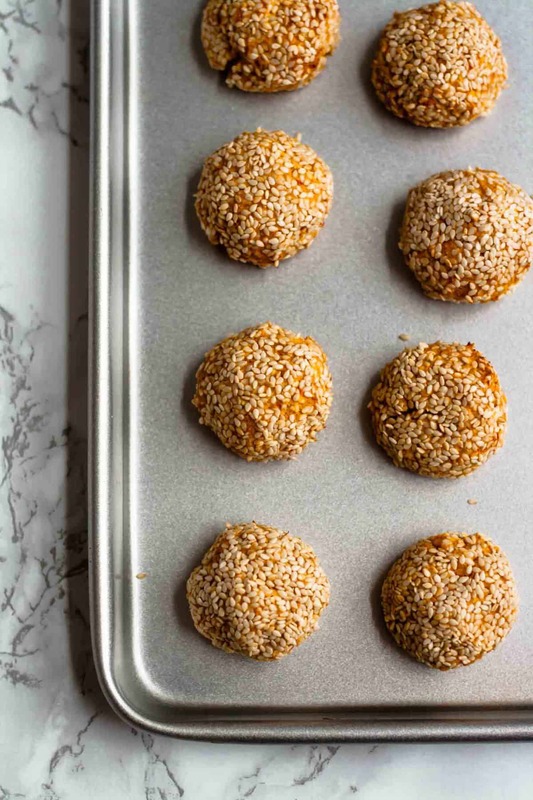 I got the idea to make these Sesame Sweet Potato Falafels in my head a little while ago and they just sounded so good, so naturally I had to make them ASAP! I wanted the flavours to be super simple, as I find things so often get over-complicated. Especially in my brain. And I knew I wanted a green sauce to drizzle over the top of them, since I’m all about contrast. And here they are! Can you tell I’m eager for spring here with all this green?! We’re currently in the grips of the ‘Beast from the East’ (who even comes up with these names?!) here and it’s freezing and I’m 100% over it. Well maybe only 99% over it. The snow is really pretty and I do quite like the novelty of feeling like I’m inside a snow globe! But come on now, I need warmth! The beetroot falafels I made last year have been a huge hit (I still love that recipe!) and so it was high time I made another falafel recipe really, wasn’t it? These ones are made slightly differently from that recipe – here the sweet potatoes are cooked first, whereas everything was raw in the beetroot falafels. They’re still really simple to make though and the flavour is just so good! 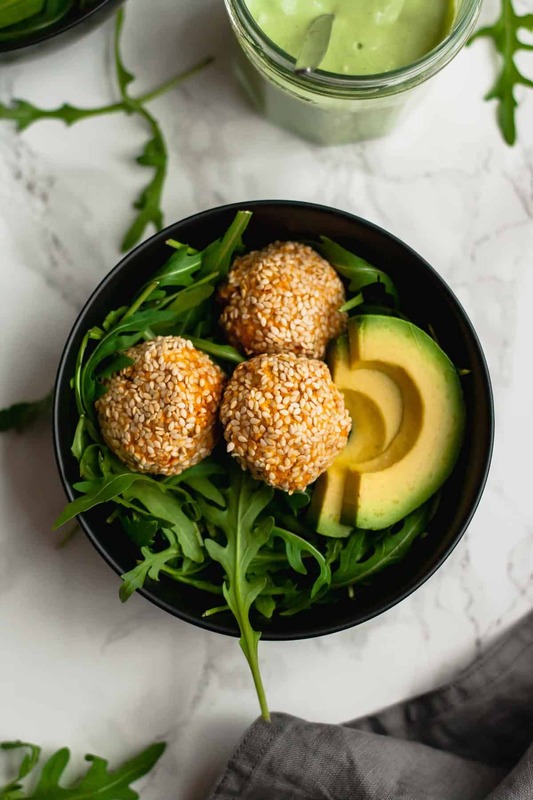 These Sesame Sweet Potato Falafels have a bit of an Asian twist to them, with the main flavour being toasted sesame (why is toasted sesame oil so irresistible?!) backed up by garlic, ginger and a good hit of chilli. All the good stuff! 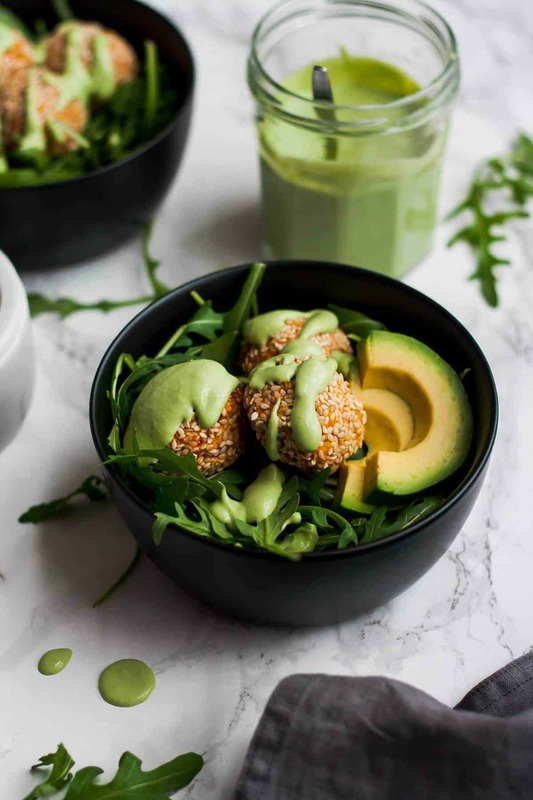 I then made a creamy green tahini sauce to go with them, with Greek yoghurt and avocado for creaminess and tahini to back up the sesame even more. This makes for a perfect lunch along with some salad leaves (I like rocket here) and avocado. The falafels are really filling so this is a really satisfying meal by itself but feel free to add whatever you fancy! Make a batch of these and keep them in the fridge so you have lunch sorted for a few days – or freeze them! I love the feeling of knowing that I’ve got something really delicious tucked away in the freezer ready to pull out for a zero effort meal. So good when I have that sinking feeling of dread late at night when I realise I have nothing planned for my work lunch the next day… thank you past-self! I surely can’t be the only one who has this problem? Preheat oven to 180C/350F. Bring a pan of salted water to the boil. Add the sweet potato chunks and bring back to a simmer. Cook for 10 minutes or so until tender. Drain and leave to cool slightly. Place 1 can of chickpeas into the bowl of a food processor. Blitz until finely chopped. Add the sweet potato chunks and continue to blitz until smooth. Transfer to a bowl. Add the remaining can of chickpeas to the food processor and pulse until roughly chopped. Add these to the bowl of sweet potatoes. To the bowl of sweet potatoes and chickpeas, add the garlic, ginger, chilli, toasted sesame oil, gram flour and salt. Stir well to combine. At this point you can absolutely roll these out and bake them but I would recommend letting them chill out in the fridge for a while, as the mixture will be easier to work with. Roll the mixture into small balls (roughly tablespoonfuls). Roll in toasted sesame seeds, if liked, and set on a baking sheet lined with baking parchment. Bake for 30 minutes until golden and firm to the touch. 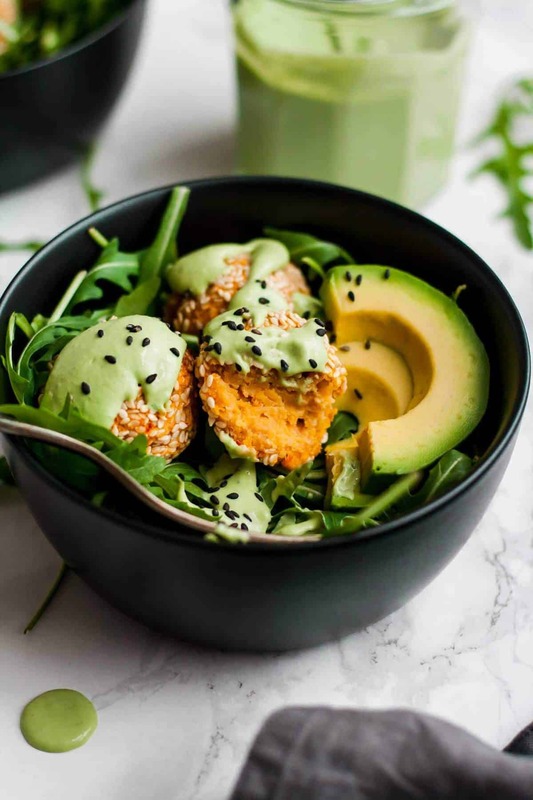 Serve with green tahini sauce, rocket, avocado and anything else you fancy! Place all of the ingredients into a blender along with a good pinch of sea salt. Blitz until smooth. Taste and adjust seasoning as desired. 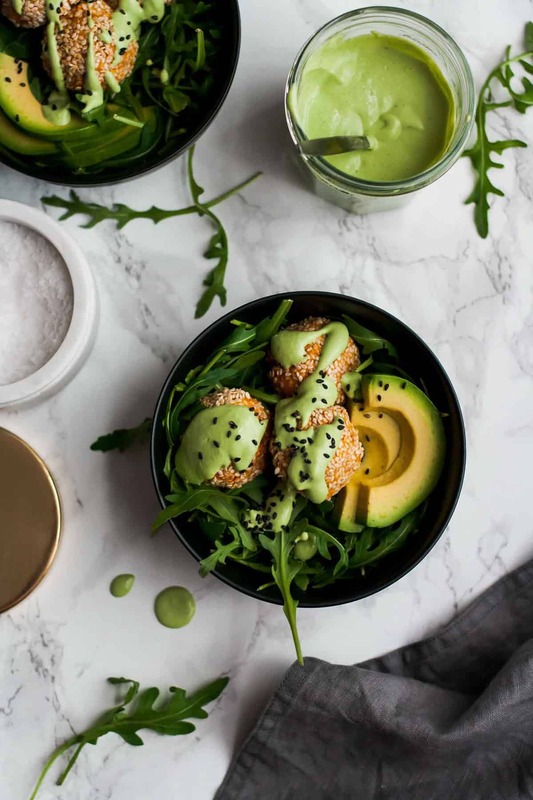 These falafels sound incredible…and that green tahini, I don’t think I’d be able to stop myself from putting it on EVERYTHING! Made these tonight and I can verify that the sauce is delicious! I accidentally used more sweet potato than the recipe calls for so I’ll have to try again while paying more attention. I’ll definitely be making the sauce again. I’m so glad you love the sauce – thanks so much for taking the time to let me know! 🙂 I hope you love the falafel just as much when you try them again.